Information about David's produced plays, with links to reviews. James is feeling suicidal and his only respite from the pressures of the world is the hour he has to himself on a park bench every lunchtime. Then one day the mysterious Frank turns up and begins to unravel James’s problems in his own enigmatic way. But what is Frank’s story? This was my first play. I’d been in a writing group in Birmingham which met fortnightly in a pub, The Old Joint Stock. Because we met in a pub the sessions were often exactly that: drinking sessions. However, one week I realised the pub had built a studio theatre upstairs and this felt to me like some kind of sign. I resolved to write a play for the studio space and try and get them to put it on. I decided to keep it small scale: two characters and one prop – the bench of the title. After finishing an early draft I printed off the script and took it upstairs. I didn’t know anyone at the theatre but I met Ian Craddock, who ran it at the time and was also a director. He agreed to read the script and to my delight agreed to stage it alongside another one-act play, The Coach. Ian was interested in new writing and especially in the work of local writers. So it was that The Bench had a three-night run alongside The Coach at The Old Joint Stock in early 2007. Ian and the actors enjoyed the experience so much that they wanted to take the two plays to the Edinburgh festival fringe and so in August that year they were staged at The Space @ Jury’s Inn. 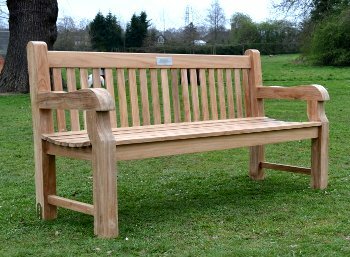 Buy the script of The Bench from Smith’s Scripts. Diane’s marriage has gone stale and she and her husband are barely communicating. When her twin sons head off to university she feels completely alone. One day she reads an article in a newspaper about women who write to death row inmates in America. She can’t understand why anyone would do this until one night, after one glass of wine too many, she finds herself signing up for membership on writetoaninmate.com. So begins a correspondence with Chuck, a murderer across the ocean, which teaches her about relationships, truth and what’s important in life. While The Bench was on in Edinburgh, I met the actress Caroline Nash, who had been performing in the other play on the double bill, The Coach. I thought Caroline was a brilliant actress and decided to write a piece intended for her. Thankfully, she liked it. This monologue was again directed by Ian Craddock and premiered at the Old Joint Stock in 2009. It then went to the Edinburgh festival fringe where Caroline performed it at The Space @ The Royal College of Surgeons. It then undertook a regional tour of venues including Northampton, Sutton Coldfield and Bridgnorth through Caroline’s company Next Page Productions. Buy the script of From Me to 3792 from Smith’s Scripts. Jamie experiences fame on a reality TV show and infamy when he swears live on Children in Need. Now with a profile and reputation, his ruthless agent, Diana, promises him he can make fortunes being a celebrity. But Jamie’s increasingly desperate attempts to remain in the public eye play havoc with his relationships with his girlfriend, Jen, and best friend, Max. As he rides the celebrity rollercoaster, Jamie must decide what really matters. Having not written a play for a few years I was motivated to do so by a trip to the Edinburgh festival fringe in 2015. I resolved that in 2016 I was going to bring my own comedy play to the fringe. Having written the script I wanted to be proactive by going to a producer with an actor attached. One evening I was watching The Apprentice on the BBC and saw Samuel Curry, a candidate on the show who, it transpired, was also an actor. Given that he had direct experience of reality TV I thought the irony would work for publicity purposes and contacted Sam. He agreed to read the script, liked it and became attached to the project. This helped me get a producer, Shrapnel Theatre, and we duly went to Edinburgh in the summer of 2016 where the play had 25 performances at Underbelly Med Quad. The cast of the d-list at the 2016 edinburgh fringe: samuel curry, syLvie briggs, jonathan mathews and helen rose-hampton. The play was directed by Phil Croft and Sam starred alongside Helen Rose-Hampton, Jonathan Mathews and Sylvie Briggs. Theatreweekly.com voted The D-List as one of their top ten plays of 2016. Writing The D-List and subsequently taking it to Edinburgh definitely rekindled a creative spark within me which has led to me being really productive since. Daniel is a good man, everyone says that. A tireless charity worker, he will do anything for anyone. However, Daniel is hiding a shocking secret: a crime he committed as a child. Now, the only person aware of what he did returns in adulthood to blackmail him. Daniel is therefore forced into a moral dilemma: confess and have the truth known, pay off the blackmailer or commit another crime to cover up the first one. For the first time in his life, he must also confront who he really is. This monologue reached the final of the 2016 Kenneth Branagh award for new drama writing in Windsor alongside two other plays. Its overriding theme is of identity and in particular how people often hide behind a constructed identity to cover things about themselves they would rather keep private. The play looks at the nature of truth and also deals with issues of class and sexuality. Eyes to the Wind reached the Branagh award final as I was preparing The D-List for Edinburgh and it occurred to me that Samuel Curry would be perfect to play Daniel. Again, he read the script and really liked it. We then found a brilliant director, Hannah Banister, who has subsequently been chosen as one of the Old Vic 12 for 2018. Hannah and Sam did a wonderful job with this play and following its Windsor run it was staged at the One Festival at The Space in London in January 2017. We have since workshopped it at The Park Theatre in London with a view to making it into a full length play. A segment of the developed work was presented at the Arcola Theatre in London as part of Bites and Scratches, an eveneing of new work, in April 2018. 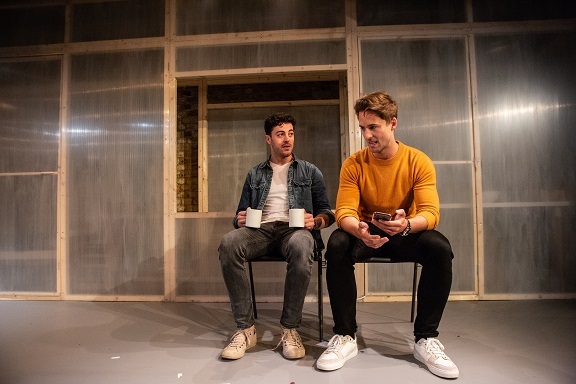 RICHARD HENDERSON AND SAMUEL CURRY IN EYES TO THE WIND AT THE ARCOLA IN APRIL 2018 (photo: ali wright). “Writer David Hendon doesn’t give us a fleeting glimpse into a character’s life or share an isolated thought; his monologue is a self-contained thoroughly gripping piece of intrigue with plenty of subtle foreshadowing woven into the dialogue. Daniel (Samuel Curry) speaks with a smooth, undeniably upper-class accent and moves with a natural elegance. His simple, casual sportswear and gold chain seem at odds with what we assume and soon confirm of his boarding school upbringing. With Daniel's current do-gooder lifestyle, perfectly sculpted cheekbones and so-trendy-it-hurts bleach blond hair, it comes as a shock to see the cancerous imperfections to his life revealed. Everyone, it seems, is capable of hiding a dark secret. Danny dreams of being a football reporter but worries his deafness will hold him back. A story about language and communication, of friendship and resilience. I was commissioned to write Sign of the Times by Rumble Theatre, who wanted to take a play to the 2017 Edinburgh festival fringe which dealt with the issue of sign language and wider themes of communication. This was a new departure for me because I was writing to someone else’s brief but it was an enjoyable experience and the play was well received through its performances at The Space @ on North Bridge. It was directed by Rumble Theatre’s Alice Wordsworth and Erin Blackmore and starred James Robertson, Felicity Green, Elizabeth Ryan, James Bowen and Tobias Crownwell. ELIZABETH GEORGE IN HOME TIME (2017). Jennifer is waiting for her son Matthew to come home from school… but there’s something she hasn’t mentioned. I entered this monologue into the Kenneth Branagh award for new drama writing and reached the final for the second year running. In some ways it could be seen as a companion piece to Eyes to the Wind as it looks at a childhood tragedy from a parent’s point of view. It was brought to life theatrically by the director, Paula Chitty, and actor, Elizabeth George, who each injected physicality and pace into the story. After its performance in the Branagh final at Windsor it was then part of the One Festival at The Space in London in January 2018. Life is made of memories. What happens when they start to fade away? This play came out of my desire to write about a family coping with dementia. The idea came from an exercise in a London writers’ club I’m in, run by Directors’ Cut Theatre Company. The exercise was to write a personal story four different ways, either from different character’s points of view or using different form and structure. 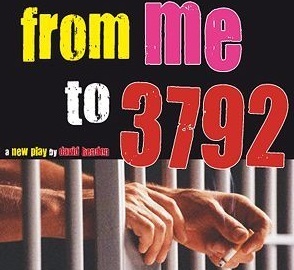 I found this an affecting experience and resolved to write a play based on the subject matter. The protagonist in this monologue, Alan, is given three words to remember by his doctor to test his short term memory: banana, Crabtree and Simon. We learn about Alan’s life and family as his memories start to fade and he faces up to an uncertain future. I sent the script to Rigmarole Productions, a new and dynamic company who had tweeted that they were looking for a new play. To my delight they liked it and wanted to produce it. CJ De Mooi was cast as Alan with Dan Phillips appointed director. This play will received its first run at Drayton Arms Theatre in March and April 2018 and was nominated for two Off West End (OFFIE) awards for Best actor and Best New Play. 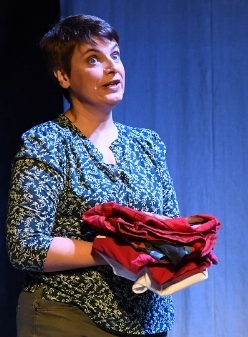 “David Hendon’s Banana Crabtree Simon at the Drayton Arms Theatre is a brave and thoroughly revealing insight in to the life of a dementia sufferer, bringing right to the fore all of the heartache which accompanies the disease. A website about British playwright David Hendon. helen rose-hampton and samuel curry in the d-list, edinburgh fringe 2016.
esther shanson performing in the woman in the restaurant at southwark playhouse in 2017. CJ de mooi as alan in banana crabtree simon in march 2018.
richard henderson in eyes to the wind at the arcola in april 2018 (PHOTO: ali wright). my short play do something! was staged at etcetera theatre in may 2018.
dominic jones in skin(ny) at southwark playhouse in november 2018.